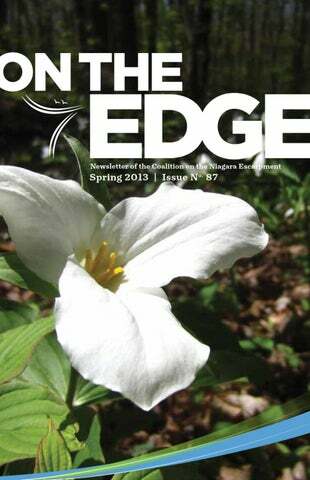 ON THE EDGE, ISSN 1491-2740, is published quarterly by the Coalition on the Niagara Escarpment (CONE). This newsletter is for CONE members and supporters to keep them informed of issues and events along the Niagara Escarpment, a World Biosphere Reserve. ON THE EDGE is produced by, and is the property of, CONE. All rights reserved. No article, graphic, or excerpt may be reproduced without the written permission from CONE. Read past issues of ON THE EDGE on our website: www.niagaraescarpment.org » Become A Member » Newsletters CONE is the watchdog of the Niagara Escarpment. We foster its protection and appreciation through public advocacy and member support. ON THE EDGE is printed in Hamilton, Ontario by The Printing House Ltd.™ on Cascades Rolland Enviro100 paper. This paper is FSC® certified and EcoLogo™ certified, manufactured with 100% post consumer waste using biogas energy and processed chlorine free. comments, I represented CONE at the Ontario Endangered Species Act Conference on April 8 and 9 in Toronto at the Royal Ontario Museum. On April 27 I will represent CONE at AWARE Simcoeâ&#x20AC;&#x2122;s Annual General Meeting and present on a panel about protecting the Niagara Escarpment with Bob Barnett, of the Escarpment Biosphere Conservancy, and Kathryn Pounder, a retired NEC Planner, at the Collingwood Leisure Time Club. During our 35 th year we are planning to celebrate by showcasing our member groups and organizations, your successes and milestones, and your Escarpment news and events. After all, without your support CONE could not continue doing its work on your behalf. Please get in contact with Josh at outreach@niagaraescarpment.org and start sending him your news and events so that we can share it in our newsletter and on our website. In the coming weeks we will be contacting our member groups and organizations by phone and by email and asking for your assistance in gathering comments for the upcoming 2015 Niagara Escarpment Plan review. We want your input! Thank you for your support of CONE over the past 35 years. I hope you enjoy this issue of ON THE EDGE! in the new document being circulated for public review and comment, recommends the construction of a Hamilton bypass expressway. Unlike the previous proposed “corridor”, a term used by the province to describe a potential expressway route, this proposal would have two crossings of the Niagara Escarpment. While the provincial proposal in the spring of 2010 was for an Escarpment cut just in the Burlington area to construct a new expressway parallel to Highway 403, the new Hamilton by-pass would have this cut, plus an additional one in Grimsby to link the by-pass with the Queen Elizabeth Highway. This would put considerable pressure to remove agricultural zoning protection on all the remaining tender fruit lands in the Town of Grimsby. During the recent five year review of the Niagara Region’s official plan, Grimsby called for the removal of all the tender fruit land north of the Niagara Escarpment in its municipality from agricultural zoning protection and the Greenbelt. While it was told by the Niagara Region that this is not now possible due to Greenbelt controls, it is preparing to make this case during the 2015 Greenbelt Plan review. Approval of an expressway in this area could well be a prelude to a major gutting of the protections of the Greenbelt for unique tender fruit land deemed to be permanently protected in the Greenbelt Plan. This would end the current magnificent vistas in Grimsby of tender fruit orchards between the Niagara Escarpment and Lake Ontario. he Fonthill Kame is a significant geological feature that is important for both the micro-climate needed for tender fruit production, (especially sour cherries), and as a ground water aquifer for the Twelve Mile Creek. It is the last cold water stream in Niagara that supports a population of Brook Trout. The Ministry of Natural Resources, (MNR), is proposing to in effect, open up areas of the Fonthill Kame that are restricted from aggregate extraction, by proposing a new definition of the Earth Science Area of Natural and Scientific Interest for the Fonthill Kame. This is because as a Niagara Regional Planning Department report points out, it is proposed to remove from the ANSI area boundaries lands that are â&#x20AC;&#x153;the most vulnerable to development expansion in the form of proposals for aggregate extraction.â&#x20AC;? This is opposed by the Town of Pelham, the Niagara Region and the Preservation of Agricultural Lands Society, (PALS). local biodiversity. Without the plants, there wouldn’t be the variety of furry and feathered creatures for us all to observe while we’re out exploring. That’s when it hit me – If I want to protect, and therefore see more of the native plants and animals that I love, I need to start protecting the habitat on which they depend on. I became a member and a volunteer director of the Coalition on the Niagara Escarpment because I believe in CONE’s people, their passion and persistancy. I’m continually inspired by the loyal dedication of CONE’s directors (both present and past). These individuals devote hours into researching plan amendments and provincial acts, writing to goverment officials and policy changers, speaking at planning meetings, and advocating for better protection of my beautiful Niagara Escarpment. Like my fellow directors, I believe that someday CONE will protect the Niagara Escarpment from harmful development for good. They’ve proven their tenacity to Ontarians for 35 years and show no sign of giving up the dream! Want to chat about the Niagara Escarpment? Send me an email at marketing@niagaraescarpment.org. I’ll be happy to hear from you! VOLUNTEER FOR THE NIAGARA ESCARPMENT The Coalition on the Niagara Escarpment is maintained through the power of our dedicated volunteers. We rely on people like you to ensure that CONE can continue its work to protect the Niagara Escarpment. Volunteer positions for NEC Meeting Monitor, Escarpment Media Monitor, Niagara Escarpment Plan Researchers, and CONE/Greenbelt road sign project assistant are currently open. Most of our volunteer positions can be done from the convenience of your home office. If you can give CONE some of your time we would greatly appreciate it. Please send an email to Josh Gordon at outreach@niagaraescarpment.org with your name, skills you could offer, and some related experience. The Burlington Airpark, located in North Burlington, is requesting approval to expand operations to accept larger aircraft. The Airpark is not on the "protected" part of the Escarpment, but immediately adjacent to it. There are concerns from local residents in the areas of noise, water runoff, extended hours of operation etc. If youâ&#x20AC;&#x2122;d like to help research this possible Escarpment threat forward your offers of help to Diane Gregg, dianejgregg@gmail.com. were crushed and applied to the skin by aboriginal men as a love potion. No report on results. It can be hard to capture the showy colour of the flowers and the delicacy of the stems and leaves in a photograph. You will feel the magic, though, when you see them first hand dotting a cliff face â&#x20AC;&#x201C; have a look before spring is over. fter a good participatory discussion the NEC passed the NEC Consultation Protocol for Radio Communication and Broadcasting antenna systems in the Niagara Escarpment Plan Area. This item was presented initially at the August NEC meeting where the NEC passed a motion to distribute the draft for stakeholder comments and any revisions. NEC approved this protocol and proceeded to apply this new protocol and unanimously approved the relocation of a Rogers Cell tower currently at the entrance to the former Queenston Quarry on Stamford Town Line at the end of Stanley Avenue, Niagara On The Lake. NEC Received a report from Daryl Cowell on the proposed Designation of the Cabot Head Area as a UNESCO Geopark. NEC agreed to hear a future presentation on this at the April Spring Policy Meeting in Hamilton. NEC Discussed the EBR:01-7540 Broader Landscape Approach MNR. NEC Commissioners saw it as cost cutting and are concerned about how it may affect protection of habitat for species at risk. They approved whole heartedly of sending the four page letter of comments and concerns prepared by Lisa Grbinicek. NEC Accepted the final Green Belt Plan technical Papers after a very precise presentation by Lisa Grbinicek. Ken Whitbread presented a 27 page outline to the NEC on the strategic role out of how the NEC staff intends to tackle the 2015 Niagara Escarpment Plan (NEP) review. Cecil Louis requested that staff add two more policy meetings to better their focus. John Riley requested a flow chart of the Big Picture with dates and maps. The plan was carried unanimously with the friendly amendments noted. UNESCO Final report to Paris on the October ten year review was presented and discussed. The report recommends the designation be retained and that the NEC continue to engage the stakeholders. UNESCO want to see enhancement of stakeholder interaction and participation in the next ten years. he Commission heard the presentation from Daryl Cowell on the inclusion of the Cabot Head Area as a Geopark. Daryl emphasized that he had been researching the data that needs to be documented for this designation however the NEC is its planning body and needs to be on side for the work to be successful. The NEC accepted his presentation and passed a motion to give future consideration to what needs to be accomplished inorder to obtain the United Nations Geopark Designation. The NEC approved the development permit Application N/S/2012/-2013/191 for the underground transmission lines within the NEP for Niagara Region Wind Turbine Corporation. The NEC approved this transmission line permit on the understanding that it was not reflecting or indicating NEC approval for the wind farm proposed for development out side the NEP area. 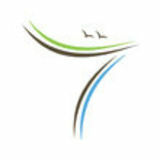 ESCARPMENT EVENTS Does your environmental group or organization have an upcoming Escarpment-related event? Whether your event is about native plants, land use planning, natural history, or Niagara Escarpment species, we want to know about it. We will be updating our website’s “Escarpment Events” page throughout the year to keep our members and supporters up to date on presentations, hikes and conferences that are happening throughout the Niagara Escarpment’s regions. Send an email to outreach@niagaraescarpment.org with event details (title, location, time, cost, description) and we’ll post it on our website.